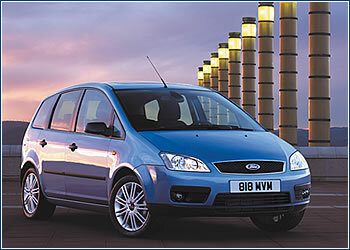 In the category of MPV compact cars, stiff competition is the rule. With its new Focus C-Max type Ford wants to assert itself by offering the largest, most spacious car in the segment, a car that also handles very well. THE ELEGANT 4.33 meter-long, 1.59 meter-tall Focus C-Max stands out with its vast glass surfaces and the highest aerodynamic coefficient value in its class. Despite its roomy interior, its designers intentionally stuck with the five-seat, two-row concept, thus providing all passengers with maximal comfort. The Trend and Ghia versions also now have flexible rear-seat systems featuring a 40:20:40 ratio. The narrow, middle seat can be shifted backwards into the luggage space, with the two outer seats shifted towards the car’s center, which changes the Focus C-Max into an unusually spacious four-seat limousine. 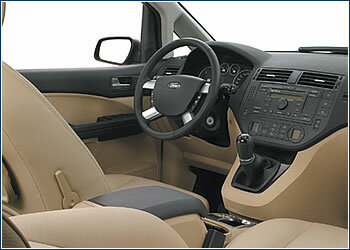 The short gear shift located in the middle of the dashboard adds to the driver’s comfort. In the basic arrangement there are 550 liters of luggage space, and with the rear seats removed, the area becomes 1,620 liters, with a completely flat floor. The Trend and Ghia versions of the Focus C-Max are the first European cars to have an electrically operated parking brake. An ABS anti-block device, EBD braking power distribution, and power brakes are included in the standard braking systems for all models. Excellent handling properties are guaranteed by a chassis with a wheelbase extended to 2.64 meters and a multi-elemental Control Blade rear axle and variable electric-hydraulic power-assisted steering. The Ambiente model of the Focus C-Max with a 1.6-l, 100 hp (74 kW) gasoline engine sells for CZK 519,900, the Trend model with 1.6 and 2.0-l, 109 and 136 hp (80 and 100 kW) turbo-diesel engines go for CZK 644,900 and 686,900, the latter coming with a six-speed transmission as standard equipment. The top of the line, the Ghia, with a 1.8-l, 120 hp (88 kW) gasoline engine sells for CZK 665,900, or with 1.6-1 and 2.0-l diesels for CZK 705,900 and 750,900.